Home Culture Hounds Books & Movies Where is Toto the dog buried? Toto, Dorothy’s beloved Cairn terrier from “The Wizard of Oz” (1939), is buried under the 101 Freeway. No, her entombment wasn’t a mob action by the flying monkeys. The 1958 building of the Ventura Freeway came through the 10-acre Studio City ranch where Toto’s owner and trainer Carl Spitz had buried her when she died in 1945. Terry was a hard working actor. In 1939, she was in “The Women” and “Bad Little Angel” as well as “The Wizard of Oz.” She appeared in 16 films in her lifetime, working with the likes of directors Victor Fleming and Cecille B. DeMille and actors Spencer Tracy, Shirley Temple, Merle Oberon, Normal Shearer, Joan Crawford, Wallace Beery, John Garfield, Hedy Lamar — and of course, her Oz colleagues, Judy Garland (Dorothy); Frank Morgan (the Wizard); Ray Bolger (the Scarecrow); Jack Haley (the Tin Man) and Bert Lahr (the Cowardly Lion). She earned $125 a week for her work on “The Wizard of Oz.” (By comparison, actors portraying the Munchkins earned $50 to $100 a week. Much of her career success was due to Spitz, a German who came to New York and then Chicago in 1926 before arriving in Los Angeles. He opened his Hollywood Dog Training School in 1927 at 12239 Ventura Blvd. Around 1935, he moved a mile north to 12350 Riverside Dr. In the late 1950s, Spitz bought a dog kennel at 10805 Vanowen St., from another legendary Hollywood dog trainer, Rudd Weatherwax, Lassie’s trainer. Spitz trained dogs there until his death in 1976. It was sold to Richard Karl in 1978. The school still exists there today. As films evolved from silent to sound, Spitz was sought out by Hollywood because of his use of wordless hand-signals to direct dogs. Terry had her first audition with Fox Studios executives for the role of Rags in “Bright Eyes” (1934). Shirley Temple was cast as an orphan and the focus of a custody battle between her cranky uncle and her young, aviator godfather. The casting process involved making sure Terry got along with Temple’s Pomeranian Ching-Ching. The audition turned into a playfest for Ching-Ching and Terry in Temple’s dressing room and won her giggling approval. Getting the role of Toto was easier. Drawings of Toto by W. W. Denslow in the first edition of L. Frank Baum’s book, The Wizard of Oz, in 1900 established that Toto was a Cairn. Producer Mervyn LeRoy had been checking out nearly 100 dogs a day for a week when Spitz and Terry arrived. Terry had the look and skills and got along with Garland and the rest of the cast. Terry even appeared with the cast at the premiere at Graumann’s Chinese Theater. Before Terry stopped acting in 1942, Spitz had been trying to persuade the U.S. military to train dogs for defense work. He succeeded in training a small group of military dogs at Fort MacArthur in San Pedro and was involved in launching the Dogs for Defense program that recruited pet dogs for training for war work. 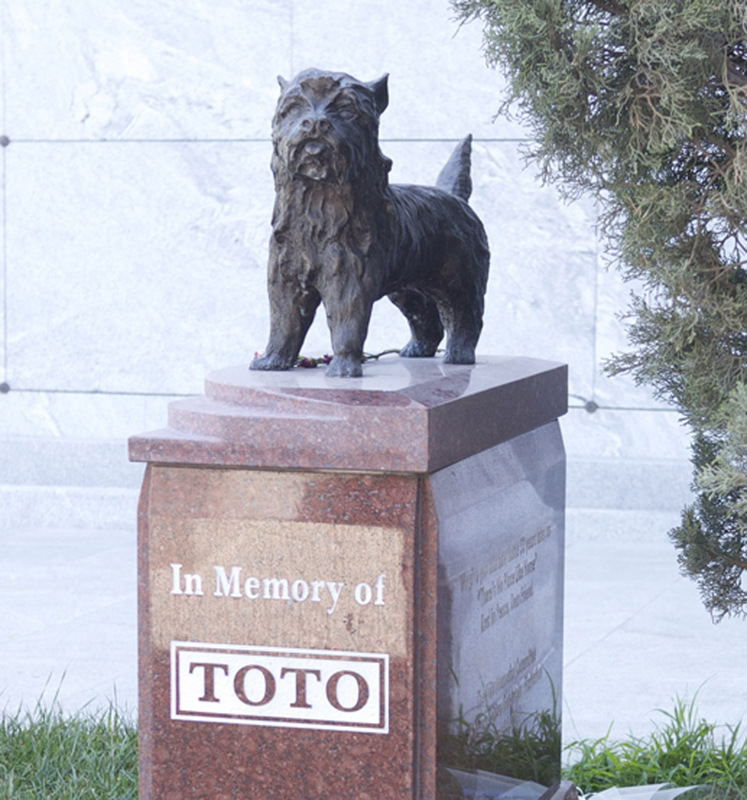 Dog lovers, celebrity grave hunters and Toto fans banded together in 2010 with a Facebook page to raise money for a memorial to Toto. The effort was spearheaded by J. P. Myers who led a campaign to place a marker on the grave of songwriter Jack Norworth, writer of “Take Me Out to the Ballgame,” and Steve Goldstein, author of L.A’.s Graveside Companion: Where the V.I.P.s R.I.P. Tyler Cassity, co-owner of Hollywood Forever donated a plot to FixNation, a nonprofit spaying and neutering service for feral cats. which will provide on-going care for the marker. The Cairn Terrier Club of Southern California provided models for the bronze statue. Toto’s memorial is in a choice location with a view of the lake. Many of the Hollywood greats she worked with are nearby, including actors Mickey Rooney, Ann Sheridan; directors Fleming and DeMille; and cinematographers Harold Rosson, Arthur C. Miller and Gregg Toland. She already had a place in our hearts. Now she has one among the stars.